Heat the oven to 400°F. Stir the crabmeat, cheese and tomatoes, if desired, in a medium bowl. Cover and refrigerate until ready to fill the pastries. Unfold 1 pastry sheet on a lightly floured surface. Roll the pastry sheet into a 10-inch square. Trim to make a 9-inch square. Cut the pastry into 9 (3-inch) squares. Cut each pastry square in half diagonally to make 2 triangles. Repeat with the remaining pastry sheet, making 36 triangles in all. Fold the 2 bottom corners of each pastry triangle to the center and press to seal. Press the pastries into 36 (1 1/2-inch) mini muffin-pan cups, with the pointed end slightly higher on one side of the muffin-pan cup. Bake the pastries for 15 minutes or until the pastries are golden brown. Using the back of a spoon, press down the centers of the hot pastries to form an indentation. Let the pastries cool in the pans on wire racks for 10 minutes. Arrange about 3 leaves arugula in each pastry. 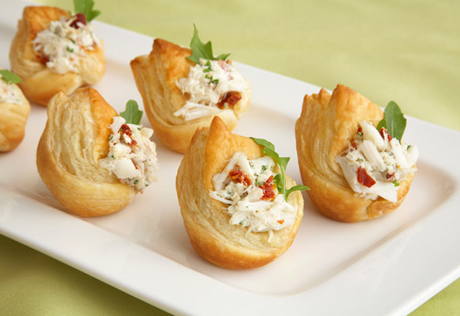 Spoon about 1 teaspoon crabmeat mixture into each pastry. Serve immediately.